Just a few sneak peeks at the dollhouse progress! I’ve been working on it feverishly lately….but I apologize for the lack of interesting any posts lately. how tos, sources, etc to come when I post all about the house in a few weeks! 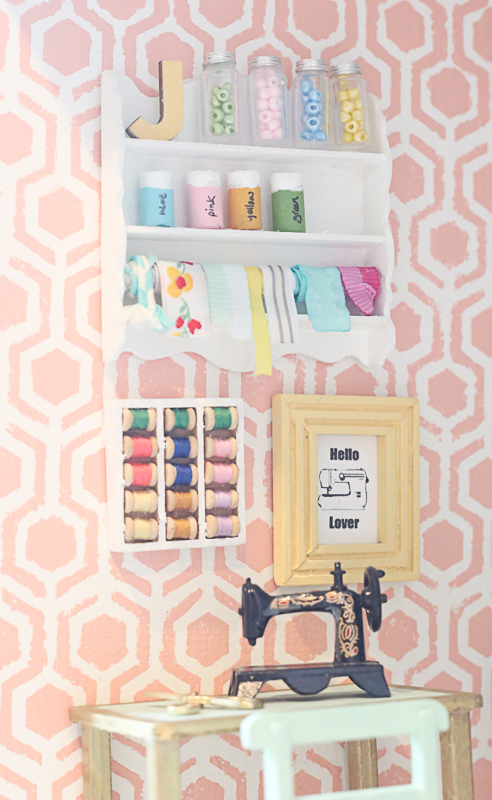 This looks like the most stylish dolls house ever, and I adore the sewing room! TOO CUTE! Absolutely adorbs. 🙂 NOW…was this meant to be a playtoy for the girls or a fun project for you? Absolutely precious! Looking forward to more pics! Love it! I was curious to know how old you and your sisters were when you got a dollhouse like this? I’m thinking about making one for my girls but they are only 5.5 and 2.5. Is that too young? I had a dollhouse all growing up, I believe, not as detailed as the one I made my girls that’s for sure. you can definitely make them kid friendly! Amazing job – I can’t wait to see all the finished pictures!! that dollhouse is really incredible and i love watching it take shape…as for the blogging angst, ((HUGS)) and just know we all go through it from time to time i guess? sometimes a little break is all i need. take care! Wow! That is amazing! Your girls are so lucky! This dollhouse is one of my absolute favorite things ever! I just want to make my house look exactly like your little dollhouse! this doll house is amazing! I can’t wait to hear more about it. My daughter got a doll house for Christmas last year and I’d love to make some new furniture and accessories for her. Wow! I’m following your progress on instagram and it looks amazing! You keep tricking me on Instagram. I am forever thinking your doll house shots are actual rooms! We have a really old doll house in the closet downstairs and I think my daughter is finally old enough to have it. You’ve got me inspired to do it up fancy! I sure don’t have a problem with your lack of tutorials and such. Who said a quilt/sewing blog has to be all sewing or all quilting all of the time anyway? Is there a rule book somewhere I haven’t seen? LOL Even in quilting classes they have other discussions than just about quilting, right? Others have compared blogging today to the old time quilting bees for ‘talking’ to others who share your craft and I’m pretty sure years ago those women did not just talk quilting or sewing. I’m betting they talked about their family or complained about their husbands or some such talk. So don’t feel bad. Just don’t leave. I LOVE your blog. 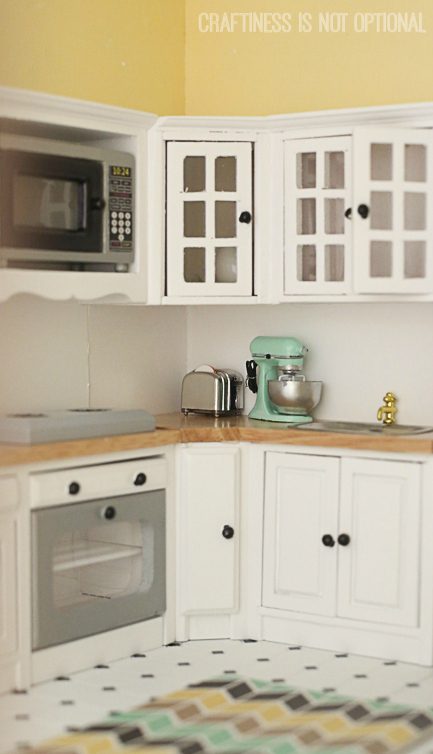 LOVE everything about this doll house – that Kitchenaid mixer? And the sewing room?! Absolutely adorable! Wowee, this is a seriously impressive dolls house! I can’t wait to see more! There’s only so much time in the day, and this looks like you’re spending it very well! This doll house is so very dreamy. I am in constant awe every time I see an IG post. People love you and are invested in your creative self no matter how much you blog. So don’t worry and keep on keepin’ on. Wow. I wish I were tiny enough to live in that house. But quite frankly – when do you sleep ? I’m tired just thinking about all you have on your plate !!! 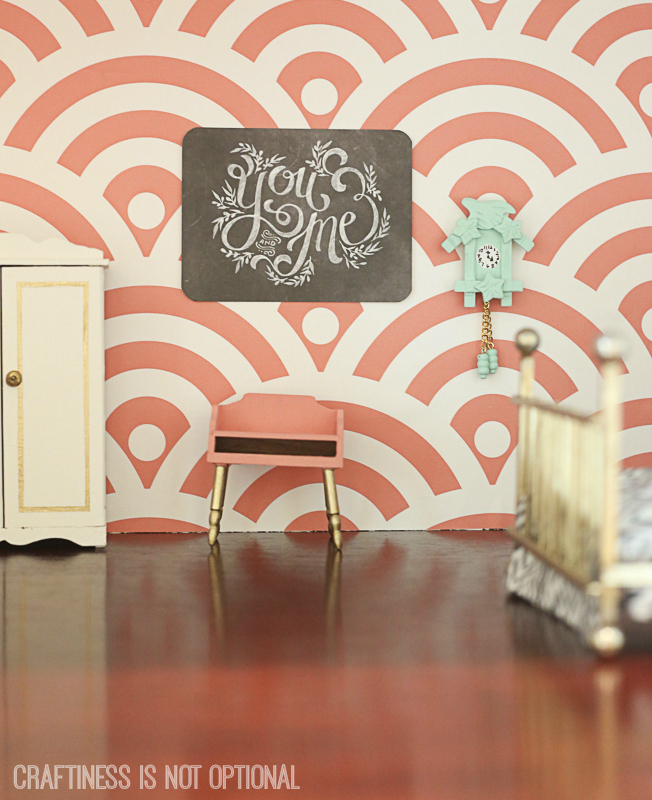 seriously – that doll house is ADORBS !!!! Wow, you really don’t do things by halves, do you! that doll house is amazing. I’m still reeling from your glue gun party and now this! As for your blog, one of these posts a month and I still be a happy follower. I LOVE this! I can’t wait to see where some of those cute things came from. We built my daughter a Barbie house and maybe some of these would work for her house. Adorable! That is just adorable. Wish my daughters were small again. What fun. so cute! the little sewing room and machine, the kitchen aid! where do you find these treasures?! hi there!! Im about to venture into my first dollhouse-making experience and came across your blog post!! absolutely in love with you’re final product!! Quick question…how did you do the flooring?? Not the tiles, but the brownish floor thats throughout the house. Thanks!!! Where did you get the dollhouse? like, the actual house? I’d love to start a project like this, but I don’t know where to go about looking for the structure!